Five good things a day for World Mental Health Day and beyond.. 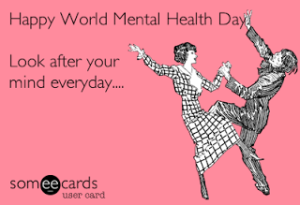 Happy World Mental Health Day everyone! If you don’t have a diagnosed mental health issue then you’d be forgiven for thinking that World Mental Health day isn’t for you. But we all have mental health in the same way we all have physical health – and that mental health needs to be understood and looked after to help us stay happier. And the better we do that, the more resilient we become. This means that when things do get difficult we’re more able to cope with them. This entry was posted in All posts, Writing my mind and tagged Anxiety, Depression, Mental Health, Mindapples, Recovery, Stigma, World Mental Health Day on October 10, 2013 by fostress.